Sometimes Shapiro seems to dip too far into minutia, but stick with him and you will delight in where these breadcrumbs lead. Debate Over Who Wrote the Plays Leads To One Conclusion: The Beatles Are Frauds! It is the penchant of critics, fans, and conspiracy theorists to look for the man William Shakespeare inside his works. However, the man himself is not necessarily in his plays and poems. The man's world is. Taking up residence inside the plays and from that perspective studying the external environment of the playwright could provide a more illuminating biography. 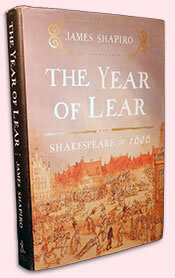 Noted Shakespearean scholar James Shapiro does just that in his latest outing, The Year of Lear: Shakespeare in 1606. He studies three plays Shakespeare likely wrote that year and reveals how they reflect on the events and social attitudes of one of the most pivotal 12 months in English history. By tying those events and attitudes to the chronicled evidence of Jacobean theater operations and the documented record of Shakespeare's life and career, Shapiro shows us the playwright at work. Along the way, you'll learn about such epochal events as the Gunpowder Plot while glimpsing into the day-to-day activities of Shakespeare himself. That last is speculative, of course, and Shapiro is ever careful to point out how much we don't know about Shakespeare's activities or his thought and creative processes. However, in the comparative and contextual analysis Shapiro uses, we at least get a more substantive figure of Shakespeare—a walking, talking, breathing enigma if not an actual corporeal human being—than we do in the two-dimensional historical records bearing his name. Shapiro starts his book with a prologue describing the January 5, 1606, Christmas season entertainment in the Banqueting House at Whitehall Palace. The main event was Hymenaie, a court masque written by Ben Jonson and designed by Indigo Jones. We don't know who exactly was in the cast, though evidence indicates Jonson played a key role, and women played parts, too (noble women did perform in plays, as long as the entertainment was in private chambers). Nevertheless, Shapiro concludes that because of their prescribed ceremonial duties to the court, members of Shakespeare's company, the King's Men, would at least have attended. This would include Shakespeare. Based on the lack of record that as a writer Shakespeare was never attached to a masque, Shapiro speculates that Shakespeare never wanted to write one because of their overly fawning nature. He also suggests that Shakespeare had grown obsolete by this time. His output was both fallow and generally underwhelming in the years following Hamlet and Twelfth Night, except perhaps for Othello, which had been staged in the Banqueting Hall just over a year earlier. His plays had grown scant in London's bookstalls, and a new generation of exciting playwrights was coming on the scene. However, Shakespeare was about to unveil a new play, King Lear, drawn from a major political debate of the period with a gotcha ending no London theatergoer would have seen coming. The fallout from a foiled terrorist attack on the English king and government two months before would provide the thematic germ for Shakespeare's next play, Macbeth. Before the year was out he would embark on a sequel to one of his long-past popular plays—King James saw himself in the historical person of one of that play's characters—and launch a cultural phenomenon still reverberating today with Antony and Cleopatra. In tone and substance, this prologue to The Year of Lear opens the door into Shapiro's historical tome. There's a storytelling quality to his writing with characters out of a Game of Thrones soap opera (King James, Queen Anne, her brother King Christian of Denmark, Ben Jonson, Marie Mountjoy) and out of a detective mystery novel (Robert Catesby, the priest Henry Garnet, the brilliant prosecutor Sir Edward Coke, Ben Jonson, and Guy Fawkes). Along with these characters and their adventure, Shapiro presents a wealth of information, minute and mighty, about life in 1606 London and Stratford-upon-Avon, a politically charged year that caused consternation from top to bottom of English society. Shakespeare was there to soak it all in. Shakespeare fans and practitioners know how keenly observant he must have been, and scholars have concluded that he was a voracious reader. He did not write in isolation but rode a wave of gossip and commentary coursing through London and touching his hometown. This wave crests in other literature of the time: commentaries, letters, and, most poignantly, sermons. These were the tweets, Facebook posts, and blogs of the day. One recurring character in The Year of Lear is Lancelot Andrewes, a bishop who oversaw the translation of the King James Version of the Bible. He was one of the king's favorite preachers, invited to give sermons on some of the key events of the year. Shapiro quotes these sermons extensively, not just for the historical record but also because—and I can avouch this having grown up in a minister's home and been exposed to a lot of sermons—this guy was a great preacher. I'd rank my Shakespearean knowledge at about seven on a scale of 1-to-10; better than the average theatergoer, perhaps, but nowhere near the rank of scholarship. Reading Shapiro, I learned several things about Shakespeare, such as his official capacity in the court as a Groom of the Chamber, how Shakespeare's daughter did not take communion that Easter despite the decree of a new law, the full impact of another new law passed that year prohibiting mention of God in plays, and the repertory of The King's Men beyond Shakespeare's works, such as Middleton's The Revenger's Tragedy (Shapiro wistfully imagines how Richard Burbage, who likely played Vindice, would have famously held a skull in his hands, reprising the image from his portrayal of Hamlet a few years before). One play that The King's Men mounted, The Tragedy of Gowrie about an assassination attempt on James when he was king of Scotland but before being crowned in England, was shut down by censors. The play itself doesn't survive, nor knowledge of who wrote it or why it was closed after just a few performances, but Shapiro spices our imagination of Shakespeare's relation to the play: with the company facing its lost investment in the production, maybe he told his fellows, "OK, I'll write you a play about Scottish regicide that will get past the censors." What's enthralling reading in this episode, however, is Shapiro's own description of the assassination attempt on James, including the king's hand-to-hand combat with his would-be murderer high in a castle tower. As interesting as Shakespeare's biographical matter may be, I most enjoy Shapiro's recounting of historical events, from the political wrangling over James's attempt to unify the kingdoms to the state visit of James's brother-in-law, the womanizing alcoholic and hard-charging partier King Christian of Denmark (Animal House has nothing on an eyewitness account of one party). Shapiro's chronicle of the Gunpowder Plot is a riveting, page-turning read: how authorities received the first anonymous letter, the arrest of Guy Fawkes, the ensuing military pursuit of the conspirators across the Midlands, the discovery of the damning document on the doctrine of equivocation, the hunt for and prosecution of its writer, Father Garnett, and the final fate of those found guilty. The conspiracy included some of Shakespeare's neighbors and friends in Stratford-upon-Avon and touched on Ben Jonson, too, who dined with some of the conspirators in the days leading up to the plot's doom's date. Throughout these dynamic lessons in history, Shapiro offers clear as well as speculative links to the three new plays Shakespeare produced that year (and some that come after, such as The Tempest). He describes a party on the royal barges of James and Christian as they sat moored in the Thames and wonders aloud how much that might have inspired the barge scene in Antony and Cleopatra. Other links of plays to events are more concrete, especially Macbeth to the trial of Garnett, the king's discovery of a con game based on demonic possession, sermons on equivocation, and the evolving view concerning the nature of evil, whether it is supernatural or entirely borne within man's capacity. In fact, depending on how well you know Shakespeare's plays, you'll pick up on these links before Shapiro details them. Sometimes Shapiro seems to dip too far into minutia, but stick with him and you will delight in where these breadcrumbs lead. In the chapter titled "Plague" about an unexpectedly long outbreak that began in late July and lasted through November, Shapiro not only provides what little eyewitness accounts he can find in his research but also statistics of death via parish records. One London parish had a noticeably low number of deaths, that of the tiny St. Olave's Parish where Shakespeare lodged. The numbers are small enough that Shapiro lists some of victims, including the household of William Tailer, an embroiderer, who died along with his servants and some children. One member of the household to survive was Tailer's toddler daughter with the unusual-for-its-time name of Cordelia; she was christened in November 1605 when Shakespeare would have been writing King Lear. Another death in this time is that of Marie Mountjoy, the wife of Shakespeare's irascible landlord. Shapiro comments on how close plague came to taking Shakespeare , who survived an epidemic as an infant, so may have built up an immunity; but really this tidbit serves as the launch of a tangent about a lawsuit involving the Mountjoys in which Shakespeare testified. It's the only record we have, via court transcript, of Shakespeare speaking (he sounds as eloquent as he wrote). Mostly, though, Shapiro shares tremendous insights into the three plays, including my personal favorite, King Lear. As Shapiro isolates certain passages, we see how Shakespeare channeled into his lines not just the events but also the buzz of the day. Shapiro describes how Shakespeare shaped his plots and built his characters in a way that wouldn't necessarily please the king but would give voice to the attitudes and concerns of his audience. "Those who believe that [Macbeth] was written to flatter King James fail to see that if Shakespeare wished to fawn over his monarch, there were easier and more remunerative ways to do so," Shapiro writes. With King Lear, Shapiro compares the play's ending in the 1608 quarto with that of the 1623 First Folio, illustrating how these two endings reflect the exact tenor of the time in which Shakespeare first wrote the play (assuming Shakespeare was responsible for the First Folio version, which Shapiro sets forth as probable). With Macbeth, Shakespeare tackles the doctrine of equivocation throughout the play, not just in the drunk Porter's quibbling, and he hints at where he stands on the origin of evil (clue: the Hecate scenes were added later, and probably not by Shakespeare). With Antony and Cleopatra, we learn why Shakespeare didn't write his sequel to Julius Caesar in Elizabeth's time (despite the set-up for a sequel at the end of that play), and how he totally reimagined Cleopatra not only from what he read in his sources but what was the norm of his time. Notably, his presentation of her as a heroic queen of Egypt rather than a mere strumpet became a pop hit in his time, as evidenced by other play scripts, letters, and even a painting that appeared years after Antony and Cleopatra first hit the stage. The last is one of many examples Shapiro presents of how Shakespeare, in turn, impacted the times in which he lived. Shakespeare's influence even shows up in the Gunpowder Plot prosecution report of Coke, who had five years earlier interrogated members of Shakespeare's company as he investigated the Essex Rebellion. The Year of Lear is a great yarn in its own right. But through its threads we get wrapped in the tapestry of life in the time in which Shakespeare wrote three of the greatest plays of all time.